Perhaps no era has prompted a more dramatic shift in gender norms than this one; and these changes are most evident in one of the most basic facets of daily life — chores. Where household tasks were once viewed as “women’s work” decades prior, nowadays, a more equal division of tasks for cooking, cleaning, laundry duties, and the like in the new millennium is far from unusual. According to the National Statistical Coordination Board (NSCB), Filipino men are getting more and more involved in household work. In fact, statistics show that a significant increase was seen in the beginning of 2000s, with employed men allotting an average of 5 hours working on chores. This is a big jump, compared to the average of 1.87 hours from the numbers gathered on employed men from 1979. With these findings, it’s exciting to see how this would continue to take off to new heights. A contemporary and fresh perspective on equality always starts from the core of the community, the family, and this is precisely why Ariel wants to keep the conversation going for every Juan. 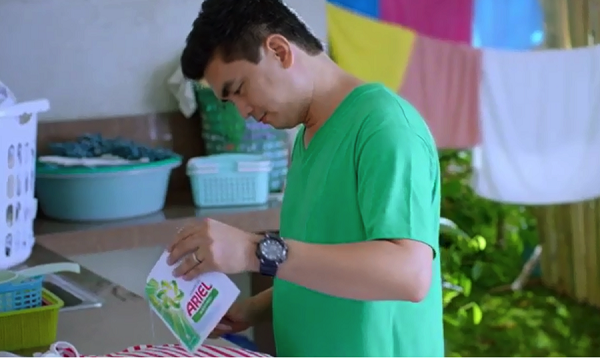 As an homage to the men who show their support with the simple yet powerful act of contributing to housework, Ariel’s #JuanWash campaign seeks to inspire men to embrace one of the crucial roles in making a house a home by simply chipping in on the laundry. 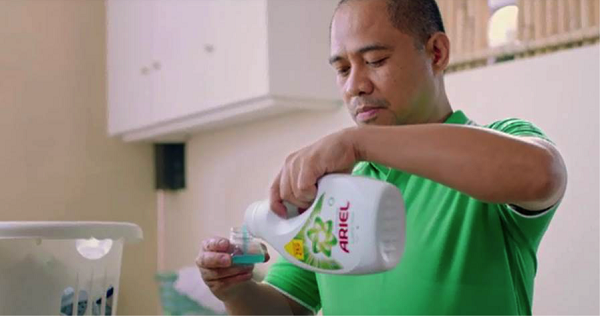 On September 1, 2017, Ariel will be launching the campaign online as a thank you to the Juan Washers, or the men who confidently help with the laundry thanks to Ariel Power Gel that makes washing clothes easily done in no time at all. “For a long time, it has been common for women to have a bigger share in terms of household chores. With the rise of double-income homes and a more open-minded cultural landscape, men are now much more accepting of the idea of contributing to the housework,” explains Luisito Morante, Regional Brand Communications for Procter & Gamble, ASEAN Fabric & Home Care. Many homes have their laundry washed twice a week. If the men of the household were to set aside one day for laundry, this can mean a world of difference for the family as a whole. As a convenient reminder of how each week gives men an opportune moment to show their support, Ariel is looking to dedicate Fridays as #JuanWash days. With this slight addition to their weekly routine, the men of the household can be a New Man as an expert in laundry, all thanks to Ariel Power Gel that makes superior clean effortless. Especially formulated for better stain removal, anyone can now reach the new standard of laundry with Ariel #JuanWash. By celebrating the men who take a stand for equality through #JuanWash, Ariel continues to break barriers after coming from the successful launch of #AhonPinay – a project in partnership with TESDA (Technical Education and Skills Development Authority) that sought to provide women with more work opportunities by training them in commonly male-dominated jobs. Through #JuanWash, Ariel further emphasizes the advocacy of empowering Filipinos by showcasing the modern Juan’s role in laundry chores as a critical step towards welcoming the change to lead. Because someone who is man enough to do laundry, is someone who cares enough to let the women in their lives have the same opportunity to progress even more. In partnership with Eat Bulaga, Ariel will be scouring through many different barangays in Metro Manila to find Juan Washers every Friday, starting on September 1. Not only is this meant to put the spotlight on individual Juan Washers, but it’s a way to show everyone how valuable their role is in further pushing equality in the family and in the community. A lot is in store for Ariel’s #JuanWash initiative, and we hope you can also take part in spreading the word for this nationwide movement! Go ahead and be a part of the change by contributing to your share of the household chores with #JuanWash – one wash at a time. To learn more, visit Ariel’s website, Facebook, and Youtube page. Should you consider getting screened for cancer?